This has always been a big want for me. I love using multi-monitor setups but only want a single laptop. Does the 2011 MBP Thunderbolt support chaining multiple monitors together? I know that you can add a monitor and say, a few hard drives, but can you connect it to 2 27" monitors and your flat screen TV (for example)? Thanks! 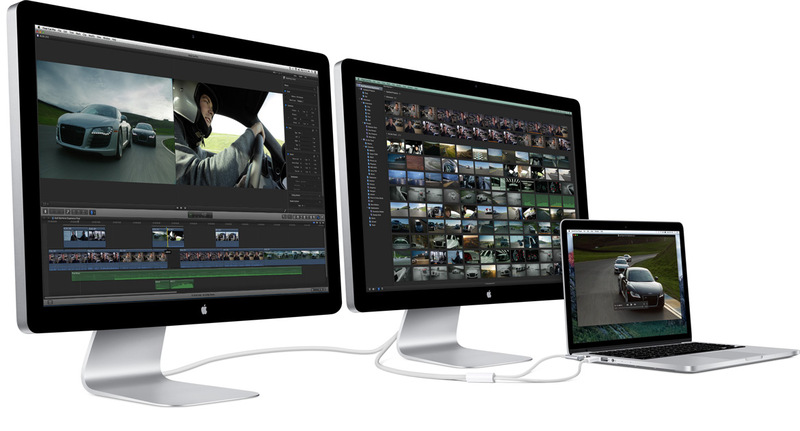 Apple maintains a knowledge base article listing which Mac models support either one or two external thunderbolt displays. The technology does allow for multiple monitors to be daisy chained. In fact, the devices you daisy chain doesn't matter, nor does the order they are in. However, like with the Display Port and eSATA, the problem at the moment is finding actual devices that support this feature. Until Apple or another manufacturer provides monitors with the ports needed for daisy chaining, this will not be possible. The advantage here is unlike eSATA and Display Port, the bandwidth available will make this more then manageable from the port itself. The biggest obstacle will be the ability to provide enough power to run all these daisy chained devices. Therefore just getting a cable will not be sufficient. Each device will be required to have its own incoming and outgoing port. Give the technology another year or so it will be more then doable and more mainstream. Apple would most likely also add these ports to their monitors fairly soon, I suspect during the next iMac/Monitor refresh schedule. It is possible now with the new MBP's and the new Thunderbolt displays. "Any DisplayPort 1.1 device needs to be the last in a daisy chain." So you will need some newer monitor (which doesn't seem to exist yet) in the middle. Not the answer you're looking for? Browse other questions tagged macbook display thunderbolt . Where can I get a Thunderbolt hub or splitter? Can I use two 27“ Cinema Displays from a 15” MacBook Pro? Can I attach two external displays to new MacBook Air?